One Hot Stove: Spooky Cookies! My friend Laureen made my halloween realllly scary (and special!) 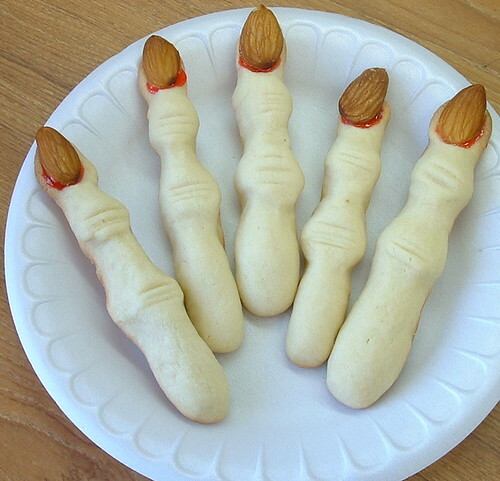 by bringing me this plate of dismembered fingers! They tasted, not of bone and gristle, luckily, but of wonderful almonds! How cute are they? What an eerily cute treat! Do you know how they were made into the shapes? The blood on the nails was a nice touch! I almost made those cookies! I found the recipe on Martha Stewart, but since I spent about eight hours in the kitchen the day I did my Halloween foods, I'm glad I decided to skip 'em. But they are lovely, aren't they? We had an Halloween party in the office and someone brought some. They must be tasty but the shape put me off. I was not able to bring myself to taste them. hey.. I came to ur blog via naughtycurry. And I mistook u for another blogger Nupur who also cooks pretty well. I even mentioned u in my blog by giving a link to the other nupur. I have edited it of course. I also have a cook blog at anthonyskitchen, I liked ur egg rassa, but I make it a little diff.